Many students with moderate and severe disabilities exhibit communication difficulties. Some may be able to communicate in a very simple way, such as reaching out their hand to request something. Others may use a sophisticated means to communicate, such as a communication device, application, or a picture system. Sadly, some students have no means at all to communicate. It is up to the team (usually including but not limited to parents, special education teacher, regular education teacher, speech therapist, occupational therapist, and physical therapist) that works with these students to assess their capabilities and find an alternative communication system that could possibly work for that student. They must receive training in its use and then teach the student and those around the student to use it. If it does not seem to work, then they must keep looking and trying until they find a system that works. And even though you are not a professional in this area, sometimes really good ideas come from peer buddies, such as yourself, about the kinds of things that a student needs to communicate – such as the cool things that all students are talking about, or the things that you have observed that the student would really like to be able to communicate. AAC should be considered when a student is not developing speech at a level that allows the student to participate within and outside of school. AAC provides a means for students to be more social, experience less frustration, and develop and practice their symbolic language skills (including written language) without the need for speech. When we communicate with others, we have many purposes in mind. These include making choices, rejecting items or tasks that are unwanted, requesting items or tasks that are needed, and getting the attention of an adult. These are often the first things a student needs to learn to communicate with his or her AAC, so that student does not use inappropriate or even harmful ways to communicate those needs. This is also a good place to begin teaching, because students begin to feel that they have some control over their environment (something important for all of us) when they are given something they have requested. When students realize that the AAC gives them that control (perhaps for the first time in their lives! ), they often become eager to participate. Another important skill on which to work, once the student is comfortable with AAC, is initiating interactions with other students. This is one area where you, as a peer buddy, can make a huge difference! List at least five situations where you would be able to help a student learn to initiate and sustain a conversation using his or her AAC. Explain how you would feel in these situations if you were the student learning to use AAC. How would having a peer buddy make this easier? Once it is decided that a person is a candidate for AAC, developing a communication system that a student can use follows four steps (Kleinert, Kearns & Kleinert, 2010). First, it is important to review the reasons the student currently engages in communicative behavior, what that behavior looks like (pre-symbolic vs. symbolic – that is, does the student already understand formal words or symbols or does the student communicate at a more basic level), and whether others understand what the student is trying to tell them. Second, it is important that the student be observed and that the team including family, speech therapist, and teachers discuss the student’s strengths and weaknesses at length. Third, the team must meet to discuss the information that has been collected, and where gaps in the student’s current abilities lie, and thus where new supports are needed. The fourth and final step is developing a communication system for the student that relies on the student’s strengths. This includes deciding on the method of AAC that will be used for a particular student. We have discussed how ACC includes relatively simple and low-cost means to get one’s message across (e.g., picture displays), all the way to more complex systems, such as the one that Steven Hawking uses. All of these systems – simple or complex - that require the student to use a computerized device, or even just pictures or line drawings, are referred to as aided AAC. Picture systems are fairly easy to understand and require little technology. The student makes choices from pictures cards that are presented to him or her. One popular system is called the Picture Exchange Communication system, and you may hear it referred to as PECS. One disadvantage of dedicated devices is that they can be very expensive. They can also be cumbersome, and off-putting to other children. Instead, many teams and families are turning to iPad2s, iPads, and iPod touches for AAC because they are relatively inexpensive, can be used for more than just communication, and are recognized and understood by peers as something that is “cool” rather than “different”. 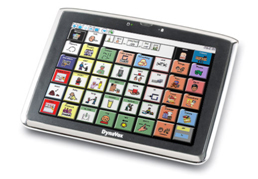 A variety of applications are available for these devices that facilitate communication for people in need of AAC. The best application currently available is called Proloquo2Go and is available in the apple app store (www.proloquo2go.com). The program allows for both picture and text to speech communication. In addition to Proloquo2Go, many simpler and more affordable apps are available that will help people with the devices that do not have disabilities to communicate with individuals who may need AAC. Some of these applications include: Speakit!, talkassist, and TexttoSpeech, and iComm which can be found in the iTunes app store . Watch the following videos. The first is a discussion with a co-creator of Proloquo2Go. The second shows just what a difference introducing an iPad or other successful AAC can have for a child with severe disabilities. 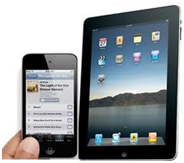 Consider how the iPad and might change your life if you were unable to use speech to communicate. How do you think it would change what you were able to do in the classroom? Would it change your social life and things you could do in your free time? Write a brief reflection. Now that you have explored the various ways that people can communicate, look at the people in your school who do not communicate well just by speech or writing. Look at the various things they need to do within school on a daily basis. How could augmentative or alternative communication assist them to take part in activities or be more independent? One more thing to think about: if you used some sort of augmentative or alternative device, what would need to happen so you would become proficient and independent in using it?